Creating a themed gift basket is super fun, both for the one gifting it and the lucky receiver. Here are our tips for making one for a kid a total knockout! Today is the big reveal of the DIY Undersea Treasure Basket, and we can’t wait to show it to you. First off, this all started when a close friend asked us to create a kids’ ocean-themed gift basket for a fundraiser she was coordinating, and, well, it felt like we won the lottery! What truly made this post through-the-roof FUN was that it’s at the heart of why we do what we do in connecting families with the wonder of the ocean! Not only are we going to share with you the how-to guide to make our version, but we’re also sharing 4 tips to make a goody basket of your own a huge hit for the whole family. 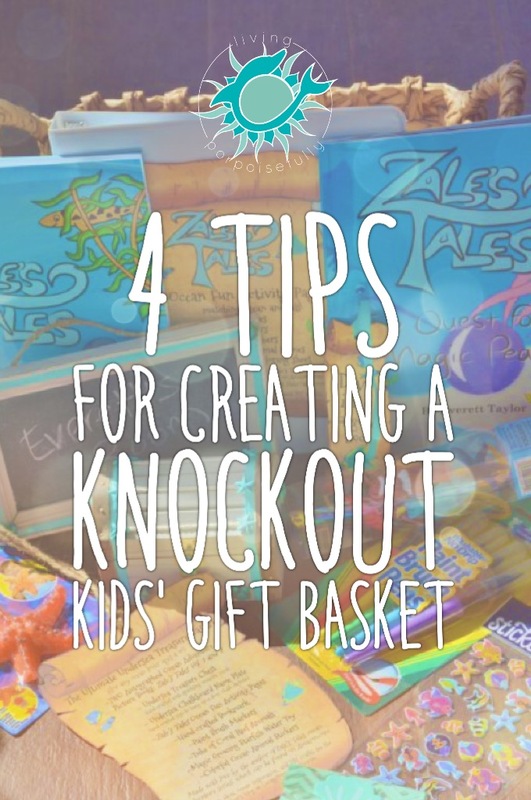 With our Zale’s Tales picture books that incorporate fun ocean learning, this basket is the ultimate “get to know and love the ocean” DIY gift. So let’s dive in! We found all of the fun add-ons (stickers, toys) and supplies for the DIY projects at our local craft store, so there’s no need to go all over town. We also picked up a sea grass basket to hold everything in. So now that you’ve seen our version and gotten ideas, the real fun comes when you get to make it your own for that special kid you might have in mind. There are so many possibilities, and it’s so much fun to put together! 1. Choose a theme to pull everything together. Of course, we’re pretty passionate about getting kids to have a fascination for the sea, but there are so many different themes to get them excited about! 4. Have fun crafting the basket with pieces that jump out at you! Whether it’s online or in the store, see what’s there and really have fun with it. The goody basket concept makes for such a joyful way to bring the wonder of the ocean (and so many other themes too) to the special kids in your life! This would be a blast to do for a birthday, a family trip to the beach (just add some sunscreen), and holidays like Easter and Christmas. So, for whichever occasion and special kid you’re thinking of, go on and brainstorm your theme and what you’d want in it. Pin or bookmark this page to revisit later when you’re ready to create, and have fun! P.S. – If you know someone who would love to bring the wonder of the ocean to the kids in their lives, please pass this on to them! Oh how fun! They will be the envy of the neighborhood 🙂 Thank you for sharing the ocean wonder in your neck of the waves! Finally, we got to see everything! Awesome! You are a great resource for those who love the ocean and want to feel the sea breezes every day in one way or another! We’re so glad that you feel that way — that is exactly our goal and what a great way of putting it. Thank you so much for your feedback, we love hearing from you!